A blooming bromeliad in the garden this a.m.
After a night of heavy rain, and an overcast gray morning, this afternoon brought blue sky, sunshine, and a delightful bloom in the garden. A beautiful pink bromeliad! The color of divine love. Unlike most budding flowers, this one blooms first inside a deep well. Then it grows taller as its stem shoots out of the hidden cavity and into the light to be appreciated for its own inner beauty. Bromeliad reminds us to open up to our deeper nature, the self that is part of a grander whole. Bromeliad also teaches that we are surrounded by all the support (love) we need. This flower demonstrates the innate potential inside of us, our resourcefulness, and capacity to change, adapt and grow. The esoteric meaning of the bromeliad can help us to challenge many of the flawed views we hold about life and ourselves. 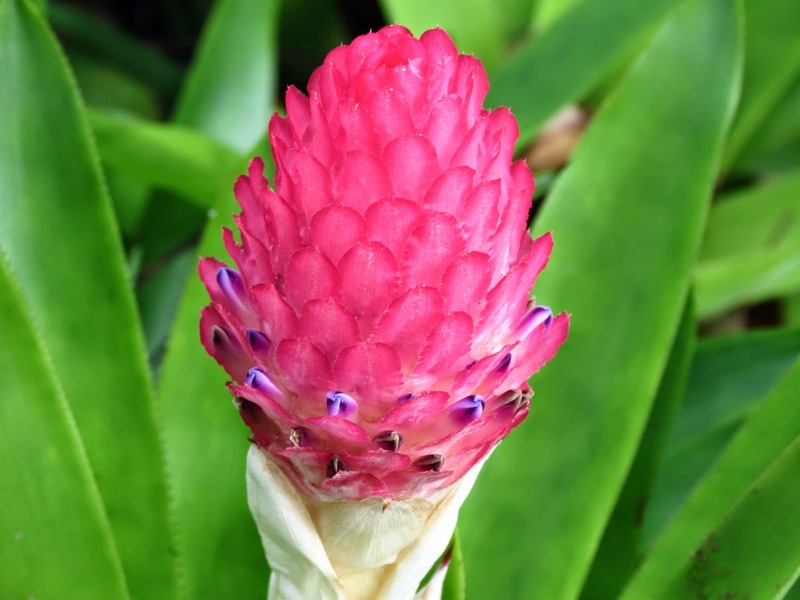 Like the bromeliad cultivates and builds upon the potential that is within, we, too, must concentrate our efforts in that direction rather that working on a list of faults that we allow to limit us from being our true self. Enjoy your day with the Angels, and celebrate your unique gift. Labels: bromeliad symbolism; angel message in flowers; be yourself.